BREAKING into the music scene in India is not easy as the competition among budding and established talents is very rife there. The only Malaysian artistes who had had any impact there were the late Tamil playback singer and actor Malaysia Vasudevan, and Yogi B (formerly of Poetic Ammo) who had worked with big names such as A.R. Rahman (for the soundtrack of Endhiran). However, a Malaysian bhangra (Punjabi dance music) singing duo made up of brothers Sukhjit Gill, 22 and Manjit Singh, 26, called Goldkartz, is currently making waves in India’s music scene. The brothers’ first album Loaded was released in 2008 which got them noticed. It was listed in the Malaysian Book of Records as the first bhangra album to be recorded and made completely in Malaysia. Their second album, 24 Karaatz, which was launched on April 1 by Datin Seri Rosmah Mansor, the wife of Prime Minister Datuk Seri Najib Tun Razak, really gave their music career a boost. The album was released in the UK, Europe, Canada and India and drew positive reactions from bhangra music lovers there. Tracks such as Ha Karde (which features Rishi Rich and Mumzy Stranger), Paisa (featuring Vibe) and Gidhe Vich Nach (featuring Panjabi by Nature) bear testament to their talent. Below are some images of Goldkartz recent visit to Bombay & Delhi for our first Bollywood project, Mauja for Office Office ! All other tracks for the said film has been produced by the Bollywood’s Most Wanted Duo – Sajid & Wajid. M-Ji (Manjit Singh Gill) recently had the opportunity to meet Bollywood’s top Music Producer, Vishal Dadlani at Singapore. Vishal spoke regarding his experiences and say on his latest Bollywood’s project for Ra.One – Chammak Challo featuring, Akon. According to him, this is one of the very first initiative taken by a top US Star to actually come down to Bombay, learn about the culture and language and making an effort to actually sing in Hindi. Other collaborations usually just involve the foreign artist singing in the language he/she is known for. Vishal shared some wisdom and of course, an honour for M-Ji. Vishal also said, he will take a listen to Goldkartz – 24 Karaatz album ! Panjabi By Nature & PBN will be performing for the launch of D’Enigma Club, Kuala Lumpur on 16th September, 2011. For a country like Malaysia, known for its scuba-diving reefs, if you happen to overhear the beat of Punjabi music, it is definitely not a day-dream! Far in the country, two brothers Manjit and Sukhjit Singh Gill of music band Goldkartz not only make Punjabi music, but also sell it to the Malaysian audiences! In Chandigarh to promote their promotional song Mauja from the Bollywood movie Chala Mussadi Office Office, the two brothers talk of breaking barriers, internationally. But first, some office talk! “Mauja is a promotional song for the movie, and we are pretty happy the way it has turned out,” says the duo. Mauja is their first Bollywood project, with contemporary beats. But this wasn’t an easy track, because how many people have you seen dancing and swaying to a song based on corruption? So, we had to bring in peppy beats and gel in with the theme of the song and movie. It is Punjabi yet modern at the same time,” shares the duo. How else would you sell a Punjabi number in South Asia? PETALING JAYA: A local bhangra band will be releasing its album worldwide tomorrow. Bhangra duo GoldKartz’s sophomore album 24 Karaatz will be released simultaneously in Malaysia, India, Britain, Europe, Canada and the United States. 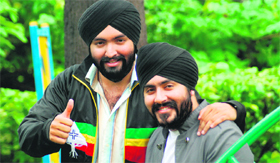 GoldKartz, consisting of brothers Manjit Singh and Sukhjit Gill, made their debut in the Urban Bhangra music scene in 2008 with their first album Loaded. Loaded was the first bhangra album to be made fully in Malaysia and was honoured by the Malaysia Book of Records for that distinction. Unlike the first album, 24 Karaatz features collaborations with musicians from outside the country. “For this album, we’ve collaborated with north Indian musician Rishi Rich, Mumzy Stranger and UK act Panjabi by Nature,” Manjit said in a press release yesterday. “We also recorded a song, Rock with You, with Indian composer-singer-producer Shankar Mahadevan,” he added.